Part of Thurgood Marshall’s legacy is the recognition that no ethnic, social or cultural group is valued above any other. Thurgood Marshall Bar Association’s membership reflects this commitment to diversity and multiculturalism. Thurgood Marshall Bar Association emphasizes excellence and integrity in the practice of law, increased diversity, multi-culturalism and community service. Diversity and equality form the core of the American landscape. Unlike most other nations, both past and present, America boasts of its tolerance, and promotes itself as a multi-cultural, multi-ethnic and multi-religious nation. Though diversity and equality form the core of our representative democracy, our journey to a more perfect union that fully realizes the legal, political and social benefits of these principles continues. As we seek to further our journey toward increased inclusiveness, diversity and equality, Thurgood Marshall Bar Association also seeks to honor our namesake, who devoted his professional life to realizing those principles. Thurgood Marshall Bar Association is an affiliate of the Orange County Bar Association. Thurgood Marshall was the 96th Justice of the United States Supreme Court. Justice Marshall was the Court’s first African-American Justice on the United States Supreme Court. Numerous individuals, from all walks of life, have benefitted from Thurgood Marshall’s efforts to increase access to the American dream of equality and fairness. 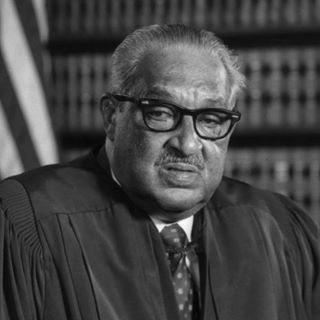 Women, persons of all races, ethnicities and religious backgrounds, and other persons traditionally less included, are now more included in our society, and our profession, because of the efforts of Thurgood Marshall. We are proud to bear his name.